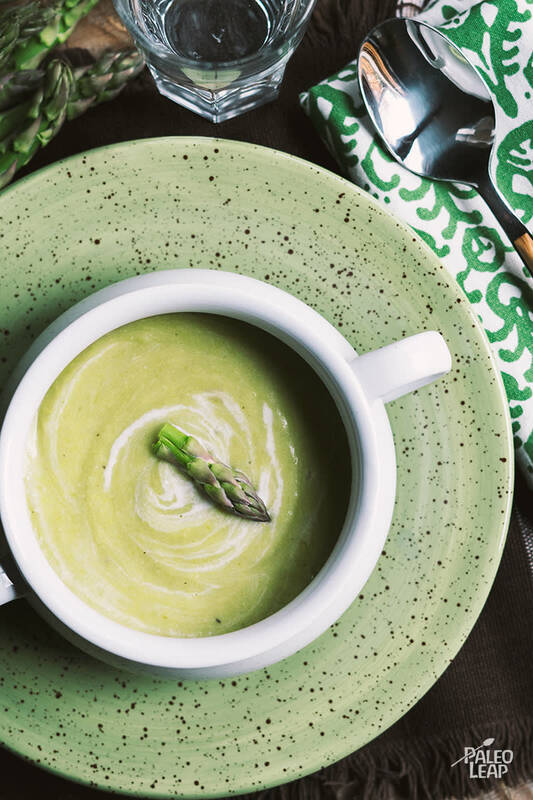 Asparagus soup is creamy and light, and best made when the enchanting green stalks are in season, but if you happen to pass by a bunch of asparagus ready and waiting in the store, don’t miss the opportunity to try this one of a kind vegetable brew. We all know that asparagus tastes absolutely delish when lightly sautéed and served with morsels of crumbled bacon; did you know that you can make a fabulous asparagus mousse too? Sometimes we need to get creative in the kitchen and swap out old notions of what food should look and taste like. Once you leave behind the grains, the processed sugars and artificial preservatives, you are left with wholesome ingredients that promote health. When you start eating the Paleo way, your life changes completely… back to the asparagus though. You should include it in your diet, if for nothing else than the sake of diversity. Though it also happens to be rich in vitamins A, K and E, as well as magnesium, zinc and selenium. It contains an abundance of essential minerals, while the flavor brings on all that is wonderful about spring. We cannot imagine life, or soup, without it. Serve with a poached egg, or a dash of parmesan if it works with you. And those bacon bits mentioned above? Feel free to sprinkle some of those on too, if you are looking for a little more protein in your meal – although it is perfectly acceptable to keep it as a vegetarian option and satisfy everyone around the table. Heat the coconut oil in a saucepan over medium heat. Add the garlic and leek; cook 3 to 4 minutes. Add the potatoes and asparagus; cook another 3 to 4 minutes. Stir in the vegetable stock and cover. Simmer 15 to 20 minutes, or until all ingredients are soft. Purée the soup using an immersion blender and add the coconut milk. Season the soup to taste and serve warm.